Cheshire is a Luke Cage villain who possesses the ability to turn invisible. As he disappears the last visible part of him is his eyes and smile. He is both named and based off the Cheshire Cat character from Alice and Wonderland. Cheshire has only appeared in a few stories but I have always found him intriguing. Cheshire is initially allied with another villain called Big Brother. He follows around Luke Cage like an invisible spy. Eventually, Luke Cage kicks down the door of Big Brother and beats him in an epic battle. Cheshire simply watches. 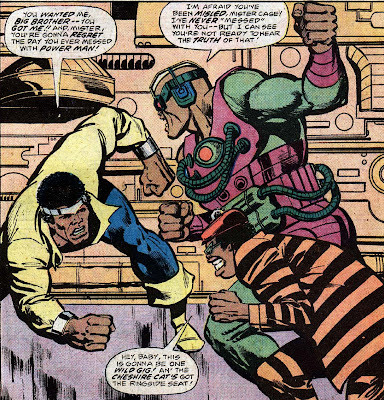 Big Brother manages to point Luke Cage in a different direction by providing him information on a competitor, the Baron. Big Brother and Cheshire feel pretty smart when Luke Cages takes down the Baron. Before too long though Luke Cage takes down both Big Brother and Cheshire. Cheshire is one of Luke Cages villains brought together into the group known as Flash Mob. Cheshire can disappear and move around invisibly, he can also teleport himself. When he disappears his eyes and smile are the last objects seen before he completely invisible. #Marvel, A #LukeCage villain that I wish we were able to see.